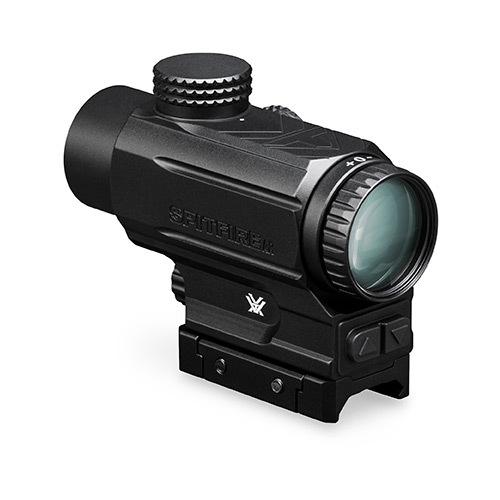 Built from the ground up specifically to maximize the quick-handling performance of AR-platform rifles, Vortex's new Spitfire™ AR 1X prism scope delivers incredible optical quality and ultra-fast functionality in a lightweight, streamlined package. The generous, parallax-free, sight picture and forgiving eyebox gets shooters on target effortlessly even in high-stress scenarios. Rear facing power and illumination intensity controls are easy to access, simple to operate, stay visually present from the shooting position and are protected from incidental contact. Ten intensity levels let you adjust to perfectly match ambient light conditions. Runs off a single, common, AAA battery. The DRT (Dual Ring Tactical) reticle is etched directly on the prism to assure consistent point-of-aim at all times regardless of whether or not the illumination is engaged. An additional yardage-marked turret cap (ballistic-matched to the 5.56 cartridge) allows the shooter to swap out the factory-installed cap for rapid dialing of known-distance shots out to 700 yards. At 11.2 ounces, the lightweight Spitfire AR excels in close to medium range shooting applications where speed is of the essence, making it the ideal choice for AR shooters who needs to get on target fast. Prism Scopes are not compatible with the VMX-3T Magnifier.